UPDATE 10:41PM JAN 29 — Chicago police just announced that they have still not found any video of any suspects nor have they found any video of any vehicles in the area of the reported attack. Detectives have "expanded the search area for cameras to be able to provide photos of the alleged assailants in this attack," CPD chief spokesperson Anthony Guglielmi tweeted. "We are continuing to broaden our search." A source familiar with the investigation told CWBChicago that the rope was "thin clothesline, straight out of the package." The Sun-Times reports that the rope "didn't necessarily resemble a noose" as has been widely reported. The TV actor who reported being attacked in Streeterville early Tuesday by men who made racist and anti-gay comments while tying a rope around his neck and throwing bleach on him asked Chicago police officers to turn off their body cameras after they arrived to take his report, according to a CPD source. Jussie Smollett, the 36-year-old star of Empire, told police that he was attacked near his friend’s high-rise apartment while walking to get food at the Subway restaurant, 511 North McClurg Court, around 2 a.m.
Crime victims sometimes ask the police to turn off their cameras when officers enter private residences, a police spokesperson said. • Smollett was still wearing the noose around his neck when police arrived at his friend’s apartment nearly 45 minutes after the attack, according to a police spokesperson. Police took the rope as evidence. • Chicago police denied an ABC report that the FBI had taken over the investigation. The federal agency is looking into a separate incident in which a threat letter was mailed to Smollett in the past two weeks. • Smollett was said to be reticent to file a police report even after police arrived. 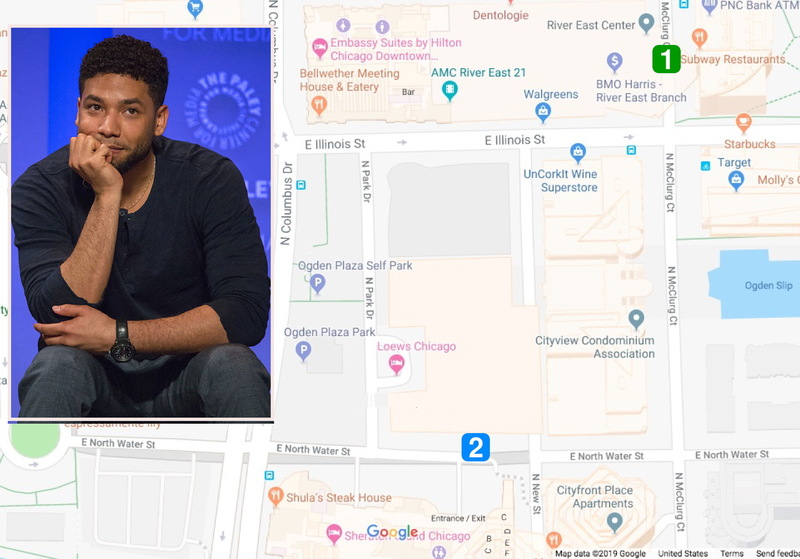 • Police were summoned to an apartment in the 300 block of East North Water Street after a man who identified himself as a friend of Smollett's called 911 and said that a “well-known” person had been assaulted and battered after leaving his apartment, and they wanted a report. The apartment building is directly across the street from the Sheraton Grand Hotel's main entrance. The block also has a lower level—similar to Wacker Drive—for parking and service access. • EMS services were declined by the friend. Smollett later took himself to Northwestern Memorial Hospital, police said. • During his first conversation with police, Smollett did not say that the attackers made "MAGA" comments, a police spokesperson said. That detail was published by TMZ.com and Smollett mentioned it during a follow-up interview with police later in the day, according to the spokesperson. • Contrary to widespread reports that the alleged attackers were white, Smollett has not identified the attackers by race because the men were masked and wore gloves, according to police. • Police are asking anyone who has video of the 300 block of East North Water Street recorded between 1 a.m. and 3 a.m. on Tuesday to contact them via CPDTIP.com. Area Central investigators may be reached at 312-747-8382.